1. List the four types of water in order from least dense to most dense. 2. What is a thermocline and why is the thermocline absent near the poles? 1. How do scientists use radiometric dating to date objects? 2. How old is a fossil that has 1/4 of the parent material and the half-life is equal to 5,000 years. 1. What is radiocarbon dating? 2. If a rock has gone through 3 half lives, what percentage of parent material is left? 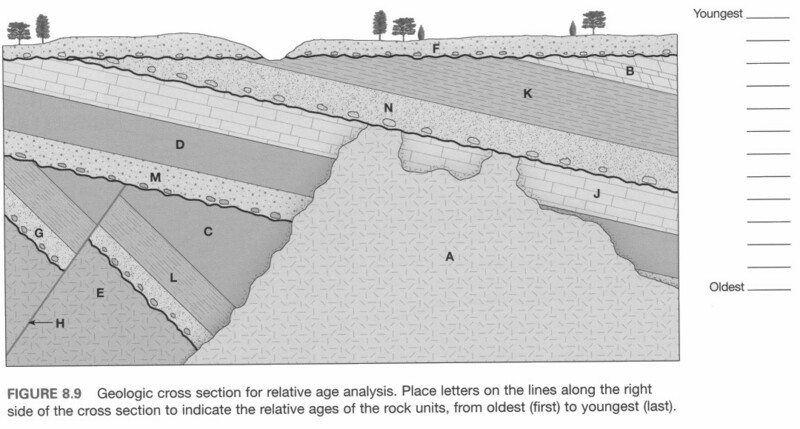 Relative date the following outcrop. 1. Relative date the outcrop below. 2. Under what two conditions are fossils most likely to be formed? 3. Explain what is natural selection. 1. Is this rock extrusive or intrusive? Explain how you can tell. 1. How could we change a metamorphic rock into a sedimentary rock? 2. If a rock was subjected to high high and melted than cooled, what type of rock would it be? 1. 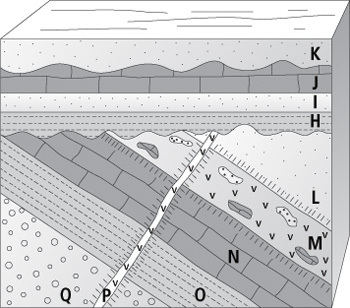 What are the layers of the earth by composition? 2. Describe where the asthenosphere is located? 1. There is a volcanic eruption in Lincoln, NE. Lava covers half of the city. What sphere is affected? ​2. The same volcanic eruption in Lincoln has many casualties due to half of the city being covered. What sphere is affected? 1. What is one branch of geoscience? What does it study? 2. What is one sphere of geoscience? (1) What layer of the atmosphere do we live in? (2) What is an object that you find in the troposphere? 1. How many minutes later do the tides occur each day? 2. What gas is causing the oceans to become acidic? 1. Explain the difference in the location of where wind currents occur and where density currents occur? 2. Write the four types of water from least dense to most dense. 1. What is a thermocline? 2. How does the density of water at the equator compare to at the poles? 1. What causes the currents to deflect? 2. Which directions are currents deflected in the northern hemisphere? 1. As the supercontinents broke apart, Antarctica did not change much in latitude. Suggest a reason why Antarctica's climate is so cold now. 2. What is the ocean's largest current?